A lot of people wanted to win this book! It was a great deal of fun checking out all the links to the remarkable crochet projects on the internet. Several people liked the granny square parasol and there were lots of beautiful granny blankets that were appealing. Despite my love of turtles and the very cute turtles that were created from granny squares, I had to go with the birdhouses. 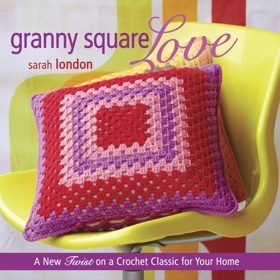 Here’s the winning entry submitted by Teresa G.
This book looks like a wonderful addition to anyone’s crochet library, especially because granny squares are so versatile; they can be used to make so many different things. When I found this pattern it was love at first sight, mainly because I love birds of every kind. Imagine how good these would look hanging outside? Although for actual use the birdhouse would need additional protection, it is a beautiful alternative to regular birdhouses. Anyways, thank you for the wonderful giveaway, and enjoy the link! I hope that all you granny square lovers will view the Comments section of this Giveaway and follow the links there to see all the granny inspired entries. Lots of inspiration, free patterns, and eye candy! Thanks to all who entered. Stay tuned for another Giveaway later this month. looks like an interesting book for a beginner crocheter. I love the different granny square patterns out there. 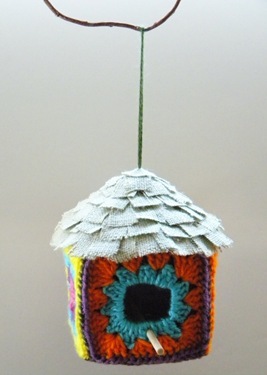 Wow – thank you so much for choosing my granny square birdhouse. I’m honored to be selected from so many great projects.